Preheat the oven to 180c, gas mark 4. Mix together the goat’s cheese, pine nuts, 2 tsp tapenade and the basil. Make a horizontal cut into each chicken breast; divide the mixture between each one and secure with cocktail sticks. Mix 1 tsp olive oil with the remaining tapenade; brush over the chicken breasts. Heat the remaining oil in a frying pan over a medium-high heat and brown the breasts all over. Transfer to a roasting tin; bake for 15–20 minutes until cooked thoroughly with no pink meat. Dress the spinach with the vinaigrette; toss with the grated parmigiano reggiano. 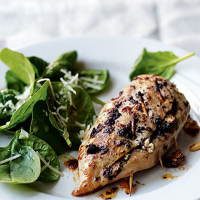 Serve with the chicken breasts.